That’s what we called them. Monday is my husband’s day off, and when the rare Monday came around that Michael’s pastoral vocation allowed him to be home with us, he would. Just the three of us: me, Michael, and Boo Radley. “It’s Monday with Michael!” I would holler as I trotted down the stairs, unlocking Boo’s cage and setting free five pounds of furry fluff. Boo seemed to understand what those words meant, for he would kick up his heels in a series of adorable binkies at the announcement and race around his rug. Then would ensue some of my favorite in-home sensory memories: the sight of my husband on the couch with a book in hand and a rabbit on foot; the earthy smell of barns mingling with living rooms as my husband replenished the rabbit’s stash of Timothy hay; the ridiculously soft feel of Boo’s fur against my cheek and the simultaneously sharp sting of one of his fine hairs landing behind my right contact lens; the loud, staccato rim-shot of my husband’s laugh reverberating up the stairs as Boo hopped, flopped, and plopped his way around the room; the gentle, muffled bass line of my husband’s murmurs as he told the rabbit what was on his mind. Pets are confidants. They are keepers of our secrets. They listen attentively and love unconditionally through tear-storms, shouting matches, and fits of skulking. They snuggle us when we smell, kiss us when we have bad breath, greet us when we are grouchy, celebrate us when we don’t deserve it, and wait by the gate for us to come home. Pets are gifts from a merciful, loving God. And God made the beasts of the earth according to their kinds and the livestock according to their kinds, and everything that creeps on the ground according to its kind. And God saw that it was good (Genesis 1:25 ESV). God saw that Boo was good, and we are so thankful to have been able to share in his little life. For this past Monday with Michael was Boo’s last. Our sweet bunny had been declining for months, but by yesterday morning, Boo was no longer able to stand upright for very long on his own. He kept falling onto his right side and was unable to get up without our assistance. We had thought perhaps he had an ear infection, and though the medicine was keeping the infection somewhat mild, his mobility problems were getting worse and worse. The vet confirmed that it was time, and my husband held Boo while he died. I am contacting you with a question about something I read in one of your books. First of all, thank you for your books, they are very engaging. I enjoyed reading The Choir Immortal, especially (as an LCMS member and choir member) your inclusion of relevant Scripture references! As a fellow Christian, I have always taken great comfort in this and am wondering why Alice does not share this with her daughter? First of all, thank you for your kind regards. I am blessed beyond measure that you read my books, let alone find them engaging. I pray that they will continue to be a source of encouragement for you as you turn their pages. Second, what a thoughtful question! Notice that the Apostle Paul, in this verse, is speaking particularly about God’s promise to give us a way out of every temptation. That is a promise to give us a way out of sinning, not suffering, and suffering is what Alice is specifically addressing on page 190 of The Choir Immortal. If God never gave us more than we can handle, then we would never die. The mortification of our flesh is, literally, our being given more than we can handle. We cannot keep ourselves alive, and we cannot raise ourselves from the dead. So, we trust in Christ to handle the matter for us. We trust in His promise to raise us from the dead on the Last Day. Alice knows this, and so, rather than encouraging Rebecca to put her faith in the work of her own (Doomed to fail!) hands, she encourages her daughter to put her trust in the sure and certain work of Christ’s hands — His pierced flesh, mortified for her salvation and risen for her justification. Jesus tells us that we will have tribulation in this world (John 16:33), but we are to take heart — not because we can handle what the world gives us, but because Jesus has overcome the world. Thanks be to God! “[W]e were so utterly burdened beyond our strength that we despaired of life itself. Indeed, we felt that we had received the sentence of death. But that was to make us rely not on ourselves but on God who raises the dead” (2 Corinthians 1:8-9). May God give us faith which trusts in His promises! Yours truly is a contributing author to He Restores My Soul, so I interviewed myself. I know. I’m still debating whether or not it was a good idea. Hymns. I also enjoy reading books about music history, composers, opera singers, nutrition, cooking, exercise, and the theology of the cross (not necessarily all in the same book) as well as stories that make me laugh and cry (namely, anything by James Herriot, L.M. Montgomery, or Bo Giertz). Forgiven and forgiving. Someone my husband likes and admires and enjoys. The author of a stand-alone novel that is worthy of a spot on your shelf. I am not sure which activity has taken up more hours of my life: driving a car or running updates on PCs. Also, PCs try to kill manuscripts. My books have the scars to prove it. Mac. all. the. way. There and back again. Like a good hobbit. I want to press my fork into a crispy whole-grain waffle topped with pools of butter, a steady drizzling of Maple syrup, fresh blueberries and raspberries from the garden, semi-sweet chocolate chips, and newly whipped cream. No, it’s not too sweet. Emily Duke. Or Arlene Scheinberg. Or (you’ll have to wait and see). Noticing you. Knowing you. Understanding you. And putting together jigsaw puzzles. I study them devotionally for comfort, I memorize them for edification, I sing them aloud as warfare against the devil, and I attempt to compose them for the joy of bringing good order to chaos. I am happiest gazing upon the farmland that lies west of my parents’ house in central Illinois or the coastline that lies north and east of Pemaquid Point Lighthouse in Maine. Microsoft Word. Oh, wait. That’s a villain from real life. I served as the content editor for He Restores My Soul. I also wrote two chapters: Chapter One is about how the Good Shepherd sometimes uses suffering to keep me in the fold, and Chapter Five is a story that considers how best to care for our sisters in Christ who regret their abortions. Emmanuel Press and I asked the Rev. 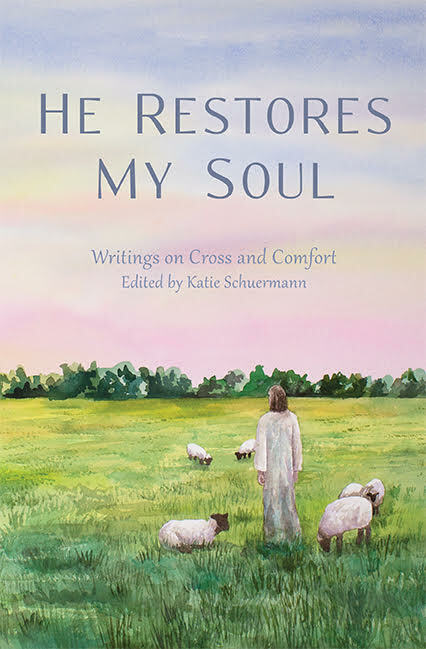 Dr. D. Richard Stuckwisch to write a pastoral response to the chapters of He Restores My Soul that will appear at the end of the book. His words of wisdom are such a help to me personally. I pray that they will be a help to you as well. Not sure there is such a thing! But many of my days include e-mail correspondence, phone calls and pastoral visits, reading and study for myself, and reading aloud to my children. I listen to music on my computer and in my car, multi-tasking all the way. Several times a week I’m gathered with Emmaus for daily prayer or Divine Service, and most of my days conclude with a glass of wine with my wife, LaRena. Depends on the particular topic, but I probably consult with my wife more than any one other person. I’ve got several go-to guys for computer related questions, all of them friends and members of the congregation. I’ll talk to my married adult children to get their perspective on many aspects of life, because I admire and appreciate their insights, and I enjoy talking to them anyway. There are a handful of colleagues that I rely upon for pastoral conversation and pastoral care for myself. I like history and theology, and I’ve enjoyed various books on personality, psychology, and sociology, though I have to filter those latter selections pretty carefully and consistently. I probably read as much or more fantasy-fiction for my own entertainment as anything else. But one of my foremost passions in life is reading aloud to my children, and that really runs the gamut of children’s literature and young adult fiction. I’m still trying to figure that out! I can hardly imagine being anything else other than a pastor, honestly. But there are days when I wonder how my life would differ if I had followed the advice and encouragement of my high school guidance counselors, who suggested that I should be an actuary. At one point I seriously considered the military academies (West Point or Annapolis), but I’m glad I didn’t go that route. Give me a hazelnut latte or a regular unsweetened ice tea during the day, a good dark beer or a glass of Riesling in the evening. What do you want to eat when your wife is cooking? She makes so many good things, and I’ve never been a picky eater. I do enjoy several of her casseroles, and she makes a great homemade pizza. “My Peace I leave with you, My Peace I give unto you; not as the world gives, give I unto you. Let not your heart be troubled, neither let it be afraid” (St. John 14:27). No way I could nail that down to a single song! My life runs to a pretty varied soundtrack, and music of all kinds is a constant in the background. I love good Lutheran hymnody, so that sometimes becomes my earworm. But I also enjoy country, pop, rock, and heavy metal, so it really depends on my mood and the circumstances at any given time. I more likely to sing along than to hum a tune on my own, but Shinedown is my go-to band more often than not. I’d have to have a particular story in mind to think of an appropriate name. 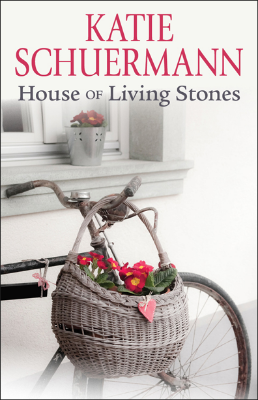 But I did get to name eleven of the heroes in my own non-fiction story: DoRena, Zachary, Nicholai, Monica, Ariksander, Oly’Anna, Justinian, Frederick, Gerhardt, Job, and Katharina. My wife, our children, and our growing number of grandbabies! My grandbabies! They’ve had me wrapped around their fingers before they could even say hello! I often turn to them for inspiration and comfort, and I find myself drawing on their words in my preaching and pastoral care. They are an important part of our family catechesis and daily prayer, as well. But they come to life, for me, in the Divine Service and daily prayer with the congregation. I like mountain views and ocean scenes, though I’m not a terribly adventurous traveler! Honestly, the scene I love the best is pulling up to the homes of my faraway children, which would look pretty nondescript to almost anyone else. Basic cross-trainers. I’m not devoted to any particular brand. Hannibal Lector, maybe? I’m normally not a big fan of the villain! Recently, though, I was impressed with Thanos in the Avengers: Infinity War. He outshone the heroes in that one. Darth Vader was impressive back in the day. Voldemort makes a great villain, but he could never be my “favorite” anything. Boy, that’s a tough one. There’s a dozen or more that I turn to with regularity. I don’t know that I have any one favorite. If I don’t have to narrow it down to one, I’d list at least Psalms 8, 16, 19, 23, 29, 51, 67, 84, 91, 96, 98, 116, 121, 127, and 130. But that’s already 10% of the Psalter! I had the privilege of responding to the profound stories of these brave and courageous women with the Word and promises of the Lord, in the hopes that they and their readers might be comforted by the Gospel, encouraged in their callings, and strengthened in their faith. Getting to know . . . Mollie Hemingway. Mollie Hemingway is an award-winning journalist, political analyst, contributor to Fox News, and — wait for it — pastor’s kid. She is also a contributing author to He Restores My Soul. Get up, check Twitter, answer emails, return calls, interview people, prepare for TV shows, drive children around, write until the wee hours, get to bed. 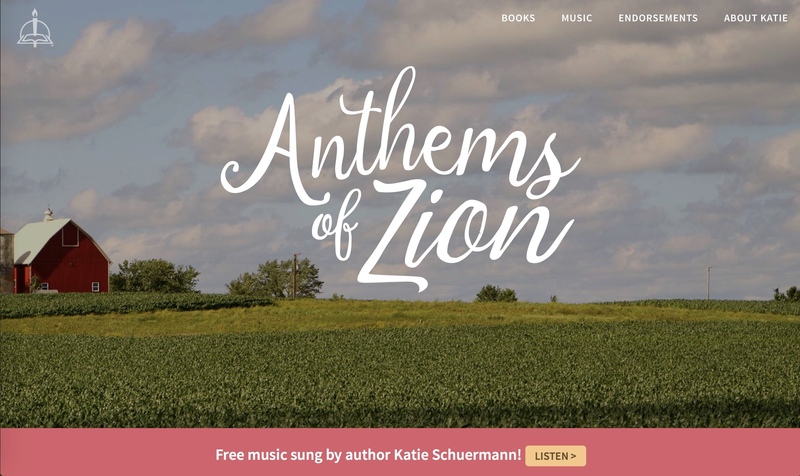 My friends regularly host hymn-sings, and I like to hum my favorite tunes and meditate on my favorite verses — usually not the same ones. Julia Habrecht, contributing author to He Restores My Soul, used to be the Head of Exhibitions at the Toledo Museum of Art. Now she’s a wife, mother, and headmaster of the largest classical Lutheran school in the nation. The woman obviously did not peak in high school. Now that the school year is starting, I rise early so I can leave the house as soon as possible to take advantage of at least an hour of uninterrupted time before faculty devotions at 7:50. By 8:20 the entire staff and student body are confessing the Apostle’s Creed and reciting the Lord’s Prayer together. The rest of the work day could be filled with visiting classrooms, chatting with parents, students, and staff, substitute teaching, administering first aid, responding to email, preparing for meetings, and hopefully enjoying a visit from my son. At some point around 5 PM I wonder where the day went. Hopefully a teacher is free to join our family for a delicious dinner prepared by my husband. After books and the first round of devotions, I spend some one-on-one time with my son singing and saying additional prayers before he goes to bed. My husband and I try to catch up on the day before deciding it’s our bedtime too. Mac. Trying to use a PC is an exercise in frustration. I’m usually humming the hymn of the week the students are learning or whatever is playing on Lutheran Public Radio. The more hymn-singing the better. A great day includes singing with the faculty, hearing ILS students share the faith through song, congregational worship, and playing hymns on the piano in the evening. Hunter rain boots — a must have while standing in the rain during school carpool. I recite Psalm 23 every night to my son before he goes to bed. The tension between caring for my son and caring for the many other neighbors God has given me to love. The most appropriate way to read this interview with Deaconess Kristin Wassilak, contributing author to He Restores My Soul and reigning Greatest Listener on the Planet, is with a glass of full-bodied red wine in hand. I’m not a spontaneous hummer. Jane Eyre. Oh, is that one taken? Hard to choose! Hans Gruber (Alan Rickman) in Die Hard or Johnnie Aysgarth (Cary Grant) in Suspicion or Khan Noonien Singh (Ricardo Montalban) in the original series and Star Trek II. Getting to know . . . Christina Roberts. Kantor Christina Roberts, contributor to He Restores My Soul, has a Zimbelstern, and she knows how to use it. 6:30 – I begrudgingly get out of bed and enjoy the cup of coffee my undeservedly-kind husband poured for me ten minutes earlier so that it would be at exactly the deliciously warm, but not-too-hot, temperature I love. 7:45 – Attempt, with varying levels of success, to get my five children and their stuff out the door and to our Lutheran school where as a staff we (my husband is one of our teachers) sing, pray, and hear God’s Word together before the student body arrives. 8:30 – Once the building is teeming with children we gather again for more singing, praying, and hearing. 9:00 – I usually sneak back home to squeeze in a run or bike ride, shower, and throw something in the slow cooker for supper. 10:30 – Settle into my office to plan and practice the music for our church and school. 1:00 – Teach music classes, band, and choir to K-8 students, and every once in awhile pop across the hall to flirt with the 7th/8th grade teacher. It’s cool, he likes me, too. 3:30 – We work with one of the most amazing staves of people (that’s how you make staff plural in music, so surely it works here, too, yes? ), and after school I love hanging out on the front step of the building to chat it up with them. They constantly remind me of the importance of delivering Jesus to these little ones that surround us. Then, sometimes, we all go get our sweat on with a good workout. 4:00-7:30 – The late afternoon and evening hours are typically filled with a blur of homework, drama practices, basketball, taekwondo, swimming, library trips, choir rehearsals, house work, and meetings. 7:30 – Read-aloud time with our five children. It’s the best. We snuggle, laugh, discuss how we would act, enrich vocabulary, develop inside jokes, and nurture our own relationships with good fiction as our tool. 8:00 – More praying, singing, and hearing as we close our day and tuck our not-so-little-anymore ones into bed. 8:30 – After the children (finally) get settled for the night, my beloved and I spend a couple of hours just chatting, working around the house together, watching a show, sipping an IPA or glass of wine with a good piece of chocolate, and reading. Then we lie down and sleep for the Lord faithfully makes us dwell in safety and rise to His new mercies every morning. My husband, my sister, and my pastor. My reading log is filled with a good deal of literary fiction, as well as some mystery, fantasy, historical, and science fiction. My friends and I used to blog our way through classic literature, and although they don’t work their way onto my nightstand as frequently, good books of the past are still the rule I use to measure what I love about reading. I also dig a good nonfiction, especially those that are both practical and philosophical as they deal with issues like time-management, organization, achieving productive and meaningful work, parenting, and finding beauty in this busy and distracted world. I use a PC, but I’m partial to a bullet journal and a set of nice pens and pencils. Vegetables from her huge and gorgeous garden. “Be strong and courageous. Do not be frightened, and do not be dismayed, for the Lord your God is with you wherever you go” (Joshua 1:9). Whatever one I last heard. Hymns are pretty much my job description. I pray them, I teach them, I practice them, I compose them, I interpret them, I study them, I struggle with them, and I adore them. Meanwhile, they instruct me, they shape my curriculum, they move my hands and feet, they fill my heart, they dominate my earworms, they bring me peace, they remind me who I am, and they connect me to the people around me. A sparkling green field of young corn framed by windmill-dotted sandhills and the full spectrum of colors available in a Nebraska sunrise or -set. Here’s how I’m super-awkward at parties: I don’t remember anything about any movie I’ve ever seen. I have the huge advantage of having the Psalms ever in front of me for work, which saves me the decision-fatigue of figuring out which ones I need most. Instead, the Lord, through the lectionary of the Church, assigns me parts of His own hymnbook. Jesus. At least I pray His presence is what dominates as I share the struggles of being a church musician fighting against despair, fatigue, doubt, and anxiety. I hope the chapter is ultimately an unveiling of the joy that Christ has put into my life so that others may see it in theirs as well.